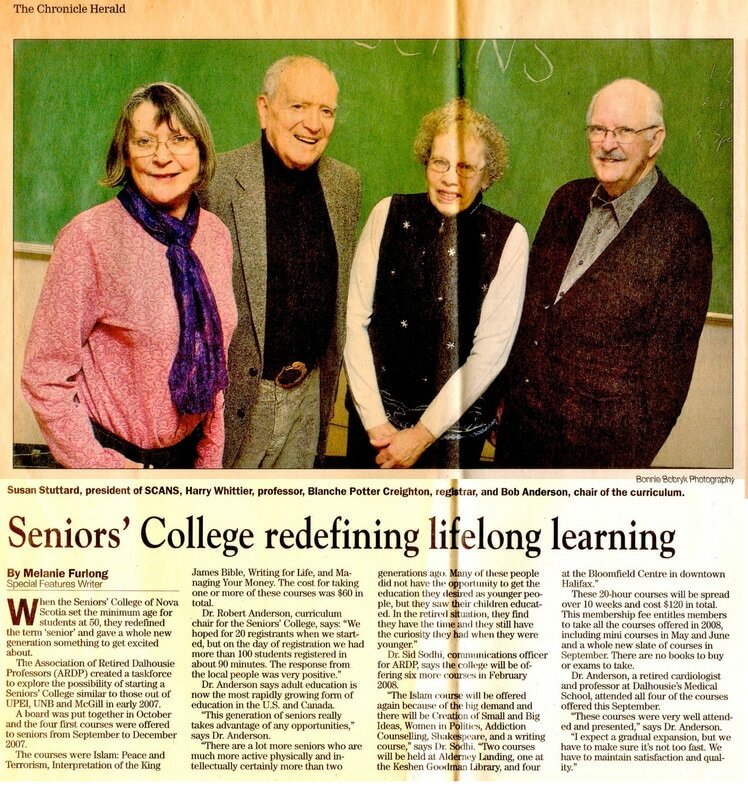 When the Seniors’ College of Nova Scotia set the minimum age for students at 50, they redefined the term “senior” and gave a whole new generation something to get excited about. The Association of Retired Dalhousie Professors (ARDP)* created a taskforce to explore the possibility of starting a Seniors’ College similar to those out of UPEI, UNB and McGill in early 2007. A board was put together in October and the four first courses were offered to seniors from September to December 2007. The courses were Islam: Peace and Terrorism, Interpretation of the King James Bible, Writing for Life, and Managing Your Money. The cost for taking one or more of these courses was $60 in total. Dr. Anderson says adult education is now the most rapidly growing form of education in the U.S. and Canada. “This generation of seniors really takes advantage of any opportunities,” says Dr. Anderson. Dr. Sid Sodhi, communications officer for ARDP*, says the college will be offering six more courses in February 2008. These 20-hour courses will be spread over 10 weeks and cost $120 in total. This membership fee entitles members to take all the courses offered in 2008, including mini courses in May and June and a whole new slate of courses in September. There are no books to buy or exams to take. Dr. Anderson, a retired cardiologist and professor at Dalhousie’s Medical School, attended all four of the courses offered this September. “These courses were very well attended and presented,” says Dr. Anderson.